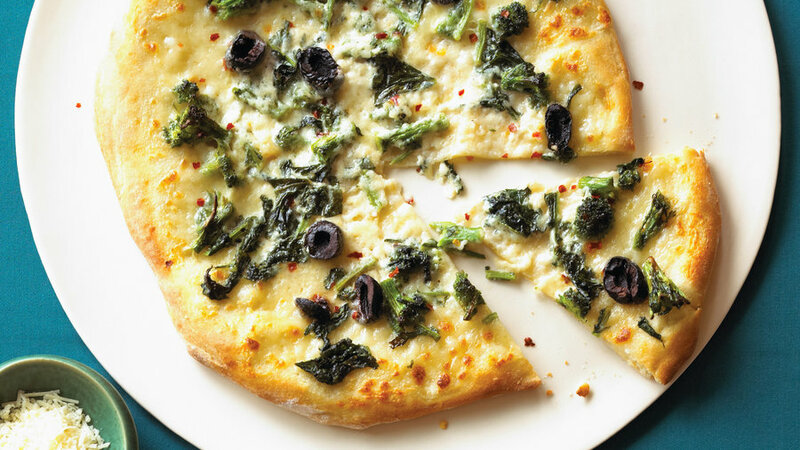 Fresh mozzarella, salty caciocavallo cheese straight from Campania, and peppery broccoli rabe make this one of our favorite pizzas. 1. Heat a pizza stone or baking sheet on lowest rack of oven at 550° (or as high as oven will go) for at least 30 minutes. With flat side of a chef’s knife, mash a third of the mozzarella into a pulverized mass. Dice remaining mozzarella into 1⁄2-in. cubes. In a medium bowl, mix both mozzarellas with mozzarella liquid, caciocavallo, cream, and buttermilk. Season with 1⁄4 tsp. salt. 2. Cut broccoli rabe into 1-in. sections, discarding tough lower stems. 3. In a large frying pan over very low heat, cook garlic in oil, stirring often, until it starts to turn transparent, about 5 minutes. Add 1⁄4 tsp. chile flakes and toast for a second, then add broccoli rabe. Stir in remaining 1⁄4 tsp. salt and several grinds of pepper. 4. Increase heat to medium-high and cook broccoli rabe, stirring, until liquid starts to evaporate and broccoli rabe is tender-crisp, 5 to 7 minutes (don’t cook it into mush). If liquid is gone and broccoli rabe is still too crunchy, add 1⁄4 cup water and cook until tender- crisp, repeating if necessary. 5. Working with one ball of dough at a time (keep remaining balls tightly covered), set dough on a well- floured pizza peel or rimless baking sheet and stretch it into a 12-in. circle. Flop stretched-out dough onto peel. 6. Spread about 2⁄3 cup cheese mixture over dough. Top with 1⁄2 cup broccoli rabe, a generous pinch of chile flakes, and 2 tbsp. olives. Give peel a good shake every few seconds to keep dough from sticking. 7. Plant tip of pizza peel (or long edge of baking sheet) on pizza stone and shove pizza quickly onto it. Bake until pizza is puffy and browned, 5 to 6 minutes. Drizzle with oil. 8. Repeat with remaining two dough balls and topping. Make Ahead: Cheese mixture and broccoli rabe topping, up to 1 day, chilled. Per slice (1⁄8 pizza): 157 cal., 43% (68 cal.) from fat; 5.5 g protein; 7.5 g fat (3 g sat. ); 15 g carbo (0.5 g fiber); 540 mg sodium; 17 mg chol.